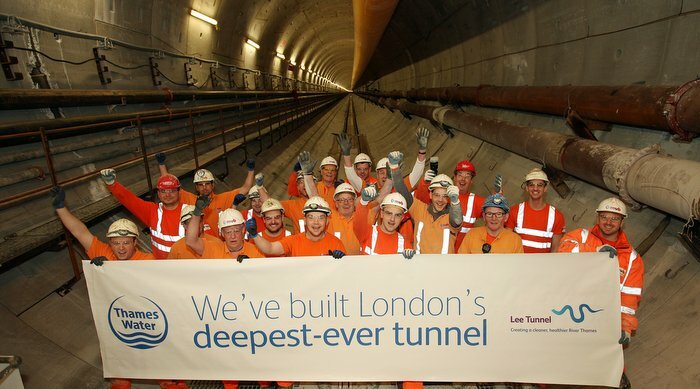 The tunnelling phase of the £635m Lee Tunnel has been delivered on time and on budget, according to Thames Water. The water company’s boring machine, which has been burrowing its way from Beckton to Abbey Mills since February 2012, has now reached its final destination. The four-mile long giant sewer – the width of three double-decker buses – will collect waste water currently discharging from London’s Victorian sewers into the River Lee. Thames Water says the tunnel is part of the solution urgently needed to prevent tens of millions of tonnes of raw sewage entering the River Thames each year. Lawrence Gosden, asset director at Thames Water, said the scheme had been on time and budget because the company had changed its traditional contracting model half-way through the project. “We formed an alliance with our contractors MVB and CH2MHill, and I look forward to the same three founding principles that helped this project achieve so much – sustainability, innovation, and collaboration, helping us deliver more capital investment at great value for money in the future,” he said. Programme management firm CH2MHill and tunnelling contractors MVB, a joint venture of three leading civil engineering contractors, Morgan Sindall, VINCI Construction Grands Projets and Bachy Soletanche were responsible for the tunnelling work. The tunnel will act as a storage tank before transferring the flows to Beckton sewage works, which is being expanded by a further 60 per cent to deal with the increased volumes. The Lee Tunnel is the first of two tunnels, along with the Thames Tideway Tunnel, which is currently being examined by the Planning Inspectorate, aimed at alleviating problems associated with an expanding population and outdated infrastructure.